Where I went to college, we used to say on graduation day, "Last year I couldn't even spell engineer, now I are one." It's pretty funny to me and points out the irony of engineering in the US--that engineers are supposed to be calculating machines, never mind the so-called soft skills. Four or more years of math, logic, science, and engineering can turn anyone into an automaton, and I was no exception. I had a lot of contempt for the soft side of life. Emotions and feelings were not real, just some figment of someone's overactive hormones acting up. In the last several years, I have done a lot of work with therapists and self-help through reading to get my head on straight and have a better life. 2. Emotions and feelings are very real to people. You have to acknowledge that. 4. The good nuggets are at a very low density in most of the reading. 5. It might be useful to someone if I attempted to explain some of these soft concepts in terms that an engineer (or maybe just a guy) could understand. In putting together the posts, I want to emphasize that I am still learning a lot of this stuff. I try to do things right, but often I fail. So if I talk about what good communication looks like, it doesn't mean that I am an expert at it. Like everyone, I'm just trying to get by. Something that I'm noticing is that as I grow older (I'm about 50 now), I tend to get more emotional and sentimental about things. 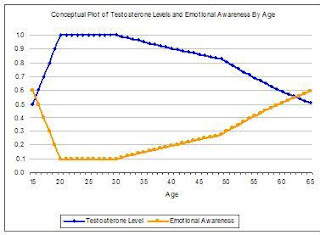 I am quite certain that it relates to decrease in testosterone (about 1% per year after age 30 in males). This is frustrating at times, but it has also allowed me to build a greater experience base with my emotional side. I have worked at a private University since 1999. I am familiar with Eng. Students and professors. I love them all and want to strangle them at times!!! You are in a very special group of people you deserve everything. you have dedicated your life for. You should be very proud of yourself. I was a stay at home mom. I worked off and on we had the illusion of the perfect middle class America bla,bla,bla had the "2 kids (Home schooled)"And then something happened and it all fell apart like a house of cards. I am approaching 50 too. it is scary since I am now alone. Thank you very much for your kind words. Divorce is a lonely time. Take care of yourself. I have some articles coming up on love and commitment. Stay tuned.